GTR hosted Turkey’s trade finance industry in Istanbul in March to assess the state of play for the country in 2019. Here are four key predictions for the year ahead. For Turkey, 2018 was a mixed year. The country officially entered a recession at the end of 2018 but the recovery is said to already be underway and local finance experts expect it to take effect gradually in the second half of this year. 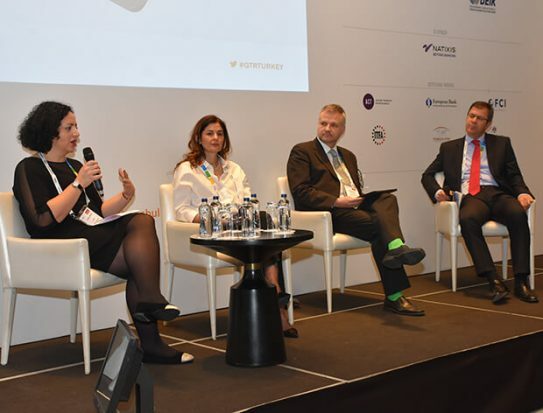 Delegates at GTR Turkey 2019 were told that the Turkish trading environment is widely predicted to remain turbulent for at least another financial quarter, while troubles brought on by the recent inflation spike and major drop-off in the lira will linger. At the same time, the country’s exporters are struggling to juggle domestic uncertainty associated with the election to be held on March 31, while also hedging against a slew of external challenges such as the knock-on effect of the economic slowdown in the EU, which includes some of Turkey’s biggest trading partners. Challenges from further afield, mostly emanating from the US, complicate matters. The loss of Turkey’s duty-free access to the US, monetary tightening from the Federal Reserve, and the general protectionist stance of the Trump administration bring their own difficulties at the worst possible time for Turkey. However, regardless of the macroeconomic and geopolitical dramas playing out at home and abroad, GTR Turkey delegates found reasons to be optimistic about the future. Ozlem Yesildere, chief finance and strategy officer at Koton, a major Turkish clothing retailer, told GTR that while liquidity was tight last year, Turkish banks were able to refinance by late November and this eased the pressure considerably, with funding opportunities now increasing again. “The local business environment is starting to turn to positive. At the moment the market waits for the elections and afterwards we expect to see where the balance will be set,” she said. Fortunately, domestic challenges are being offset by strong export potential in several key regions. For Turkish banks and corporates, operating in an environment of organised chaos is normal. “Businesses here are experts at crises,” quipped one attendee representing the Turkish arm of a large international retailer. In the first session of the day, chief economist for Işbank Izlem Erdem highlighted that Turkish exports were a major contributor to GDP growth in 2018, hitting an all-time high with a 30% increase compared to 2017. This was partly due to a rapid 30% decrease in the value of the lira – a consequence of the country’s trade war with the US, which put Turkish goods at a competitive advantage internationally. Nevertheless, exports are expected to have returned to normal levels when Q4 data is released. The lira remains at a 10-year low, but attendees and speakers told GTR they expect government actions to tighten monetary policy in 2018 will begin to take effect by Q2 2019 and stabilise the major volatility in Turkey’s FX market. The Mena region and the African continent are expected to be the hottest growth areas for Turkish exporters in the coming years, although business there is unlikely to eclipse exports to Europe. Delegates heard from multiple speakers that Turkey’s unique position as a gateway to Asia and the Middle East from Europe, along with its strong business relationships in Africa, mean it’s likely to benefit significantly as those emerging economies continue to grow. Turkish manufacturers and electronics producers will benefit the most, with speakers citing major building projects in Iraq, Ethiopia, Kenya and elsewhere as early examples of opportunities for major goods and services exports. “The African continent has gained substantial importance for any kind of Turkish goods and services. Turkish exporters are in the front line there and are present at virtually every market, even challenging countries like Somalia and Mali,” explained Aleksandar Medjedovic, executive board member at the Turkish-German Chamber of Commerce. Gultekin noted that Turkey’s recent efforts to secure new free trade deals (FTAs) with African nations, as well as elsewhere, such as with Japan and Ukraine, will strengthen its ability to boost exports going forward. Since 2017, Turk Eximbank has signed 23 bilateral agreements with banks, export credit agencies (ECAs) – including those in the UK, France, Italy, Thailand, Japan and South Korea – as well as regional and international financial institutions such as the African Trade Insurance Agency, among others. These deals represent Turkey’s ambition to build its credentials as a trading powerhouse with links in all major world markets and become less reliant on EU markets. As a non-EU country, Turkey also stands to grow its trade with the UK after Brexit. The UK is currently Turkey’s second-largest export market after Germany. Turkey’s export windfall is contingent on the UK securing a deal with the EU, however, as a failure to do so would see Turkey-UK trade fall back on WTO terms as no continuity agreement has been signed. Chris Gaunt, chairman of the British Chambers of Commerce Turkey, told the event that a no-deal Brexit scenario would be problematic for both countries and despite trade talks continuing the situation remains opaque. US President Donald Trump’s decision to re-impose sanctions on Iran is crippling Turkey’s ability to do business with its neighbour. The sanctions affect Iran’s banking sector as well as oil exports and shipping, which is causing a major headache for its trading partners. The nature of the US sanctions bring far-reaching complications to trade, and severe consequences for breaching their terms. Commenting after the conference, panellist Ryan Fayee, partner at US law firm Hughes Hubbard & Reed, said: “With a shared border with Iran, Turkish companies engaged in cross-border trade put themselves at intense risk by engaging in Iran-related transactions involving US goods or US dollars. On top of disrupting Turkish business abroad, Trump’s domestic policies are also causing grief for Turkish exporters into the US. The recent decision to terminate Turkey’s eligibility for the generalised system of preferences (GSP) programme, which allows developing countries duty-free access for certain goods into the US was not well received by Turkey’s export market. Together with Iraq, the US is Turkey’s joint-fourth-largest export market, with imports valued at US$8.3bn in 2018. Turkey’s preferential import rights were revoked after the office of the US trade representatives concluded that the country is now economically developed enough to no longer need additional support. The country’s removal from the GSP programme was revealed the day before GTR Turkey and led several delegates to probe US speakers on what it would mean for their business and ask why Trump had chosen now, when Turkey is in an economic downturn, to revoke its support. Fayee told GTR that the move is consistent with Trump’s broader protectionist trade policy and is specifically intended to resonate with Trump’s populist base, principally those in the industrial and manufacturing sector who feel marginalised by the export of jobs to foreign workers. Today, business with Iraq accounts for just under 5% of Turkey’s total trade. Several speakers confirmed to GTR that peace in Syria, as well as being a major step in easing the humanitarian crisis in the region, would be a boon for Turkish exporters. But, all were quick to note that the situation is far from stable and that it is only the very beginning of what will undoubtedly be a very long road to recovery for Syria and its people.